In life, as a general rule, I try not to be a fanatic. Fanaticism feels unseemly. It's the gateway to all sorts of bad outcomes: the Crusades, terrorism, and Donald Trump come to mind. It seems like American food culture has taken a strong turn toward the fanatical in recent years; the rise of smart phones and 24-hour food television and this thing where everyone self-identifies as a "foodie" while masquerading as a restaurant critic on Yelp. To most of that, I say good grief. But if I have an exception to my avoidance of food fanaticism, it's Japan. The food in Japan is just so good and so varied. There's such a strong commitment to the craft, to training, and quality control. If you go to the shop that only serves gyoza or soba or tonkatsu, you know that behind the scenes, there is a person who has spent years specializing in that one thing and really cares about the product quality and presentation. 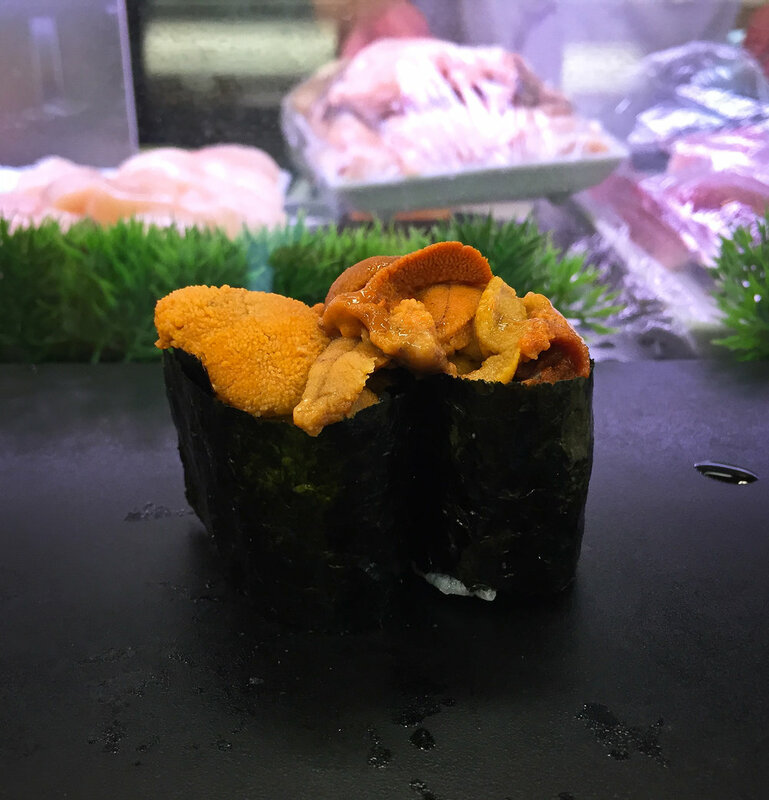 Food in Japan is also a lot cheaper than eating comparable food in the U.S. and, as I've written about on this blog before, there is no tipping at restaurants. And it doesn't matter if you're in Tokyo (home of more Michelin stars than New York, Paris, and San Francisco combined) or in the hinterlands. Great food is everywhere. Hamachi Setto. Sushizanmai, Ginza, Tokyo. Sake. A focus of our trip was sake. We had tours and tastings at three breweries, Kenbishi and Konishi in Hyogo prefecture and Hananomai in Hamamatsu. The below image at left shows me doing my homework the night before we left for Japan. At right is a sake specialty store in Tokyo Midtown. Izakaya Fare. 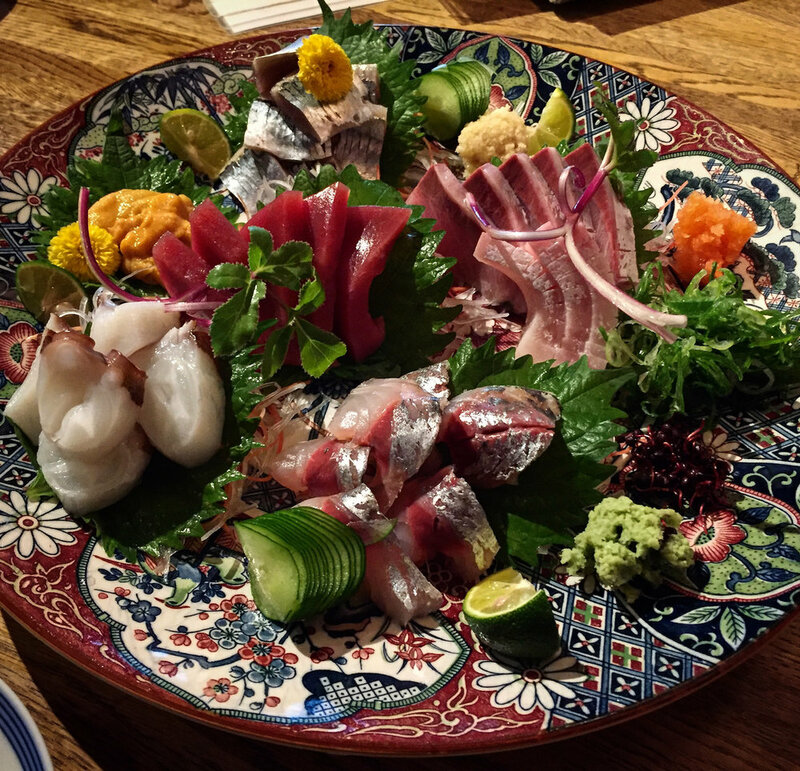 On our first night in Kyoto, we went to an izakaya called Yaoya, which was the recommendation of Sushi Sam (chef at our favorite sushi place in San Mateo). We had buri kama (left), fugu sashimi (middle), and a sashimi plate (right), as well as the baked shirako further down and a great deal of sake. Sushi. I try to eat as much sushi as I can in Japan. Compared to the US, prices are cheap, and the average quality is much higher. 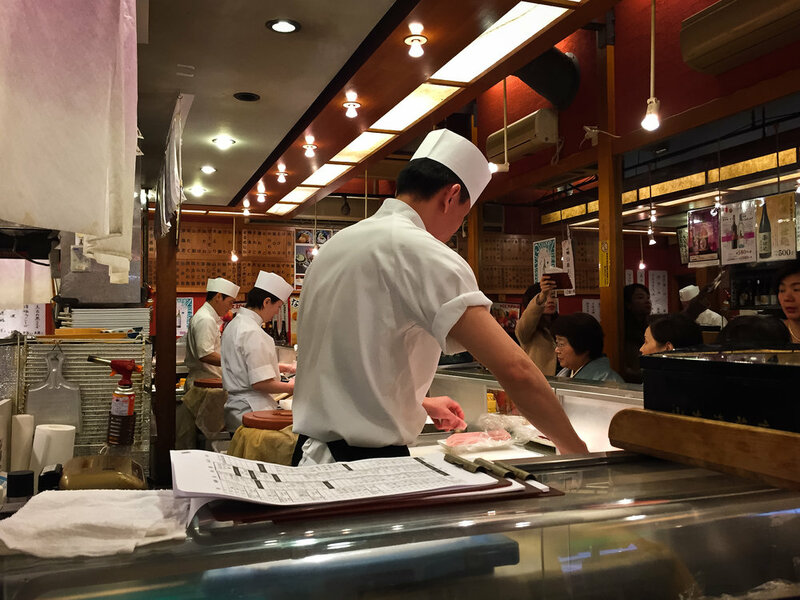 These images are from Sushizanmai, which has some 24-hour locations in Tokyo near Tsukiji, where we had breakfast on our last day. 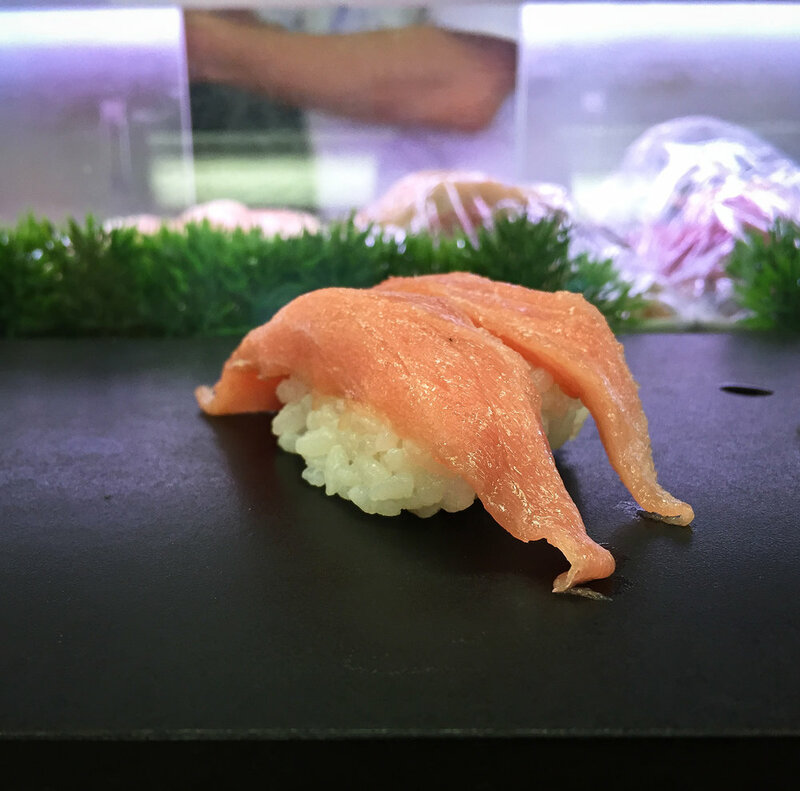 Further on down are photos of a seared/raw comparison set with tuna, salmon, hamachi, and beef, taken at another Tsukiji-area shop. Sake and Cheese. Sake tasting with the owners of Kenbishi. 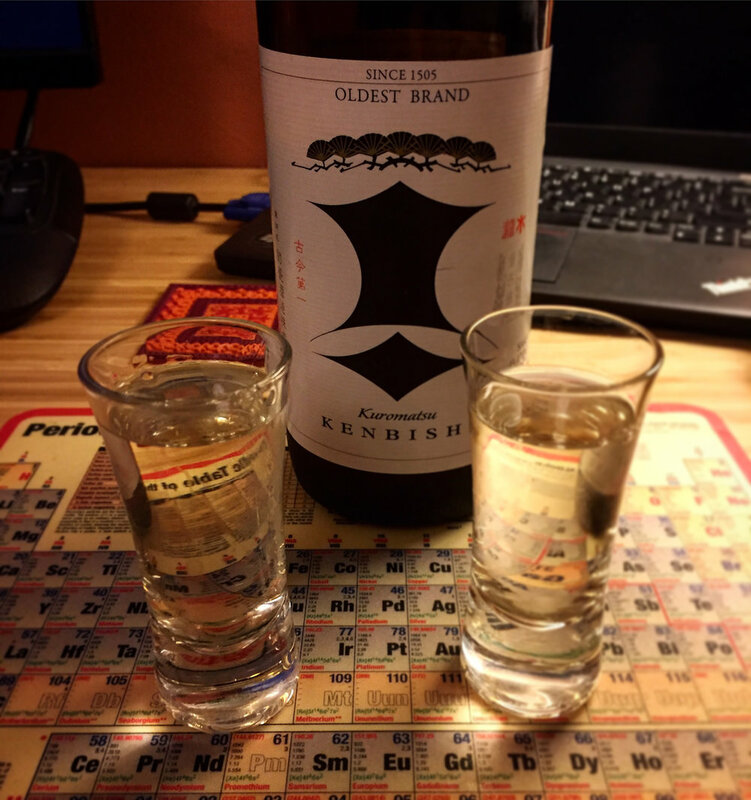 This was eye-opening, and you can rest assured sake and cheese will be coming to Shiba Ramen and The Periodic Table. Local Specialties. In Japan, every place has some regional food specialty. In Hiroko's hometown of Hamamatsu, cabbage-stuffed gyoza are the thing. We went to Ichimatsu, a famous local place that serves only gyoza and a few sides. At Hiroko's parents' house, we ate fresh fugu (blowfish) caught by a friend, shabu-shabu style. And in Kyoto, we had the regional ramen, a shoyu-heavy "chukasoba" style ramen. Graduate Level Eating. Every once in a while, you'll get a chance to try a fairly challenging not-for-beginners food in Japan. Here we had grilled shirako (soft roe), a coiled membrane of cod sperm. This had a really raw and earthy sort of flavor, not for the faint of heart. The tempura soft roe at Tan-Etsu (further below) was awesome, but this grilled one was tough. 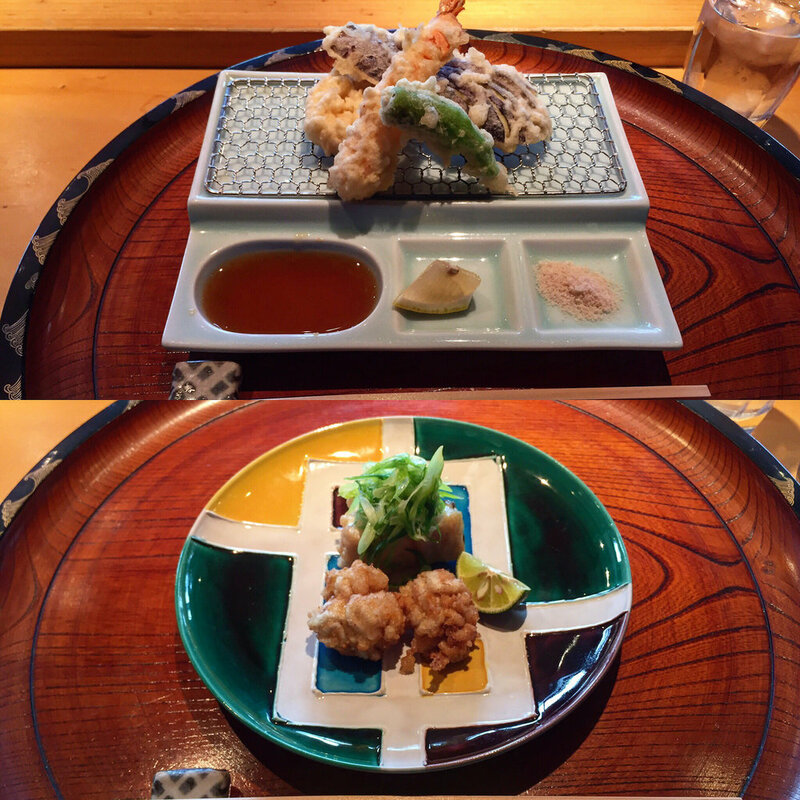 Photo on the right is chicken sashimi. Sounds weird to westerners, but it's really not much different than eating fish sashimi. Similar texture, and the flavor is nice. Tiny Ramen Shop. We visited a popular ramen spot in Tokyo's Ginza district. There were only 8 seats in the restaurant, surrounding the little bar in the image below. We had creamy chicken "toripaitan," to compare it with Shiba Ramen's White Bird ramen, as well as a spicy and fish-heavy tsukemen. The ingredients and presentation were outstanding. Kenbishi Brewery Tour. Koji rice. Kaiseki Lunch. The images below came from our lunch kaiseki (Japanese full course) at Tan-etsu in Tokyo Midtown. The food and service were outstanding, and the price per person for an ~6-course lunch plus sake was only around $65. Among the highlights were tempura shirako (soft roe) and two spectacular crab dishes, one a female crab and one a male crab. Wrapping it Up. On our final full day in Tokyo, we visited Ippudo Ramen for the first time. This place is really popular in NY, and is coming to the Bay Area in 2017. It was solid. 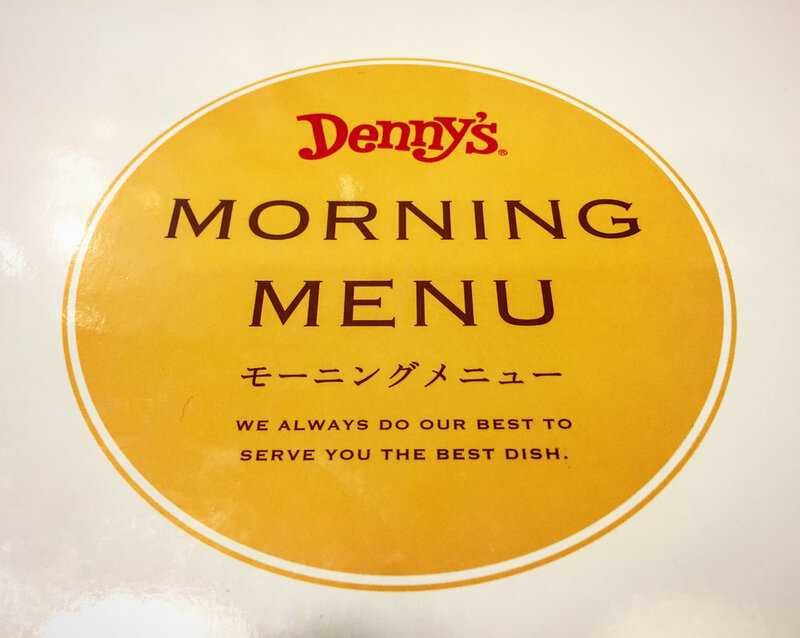 We had breakfast at Denny's, which is totally unlike American Denny's. The breakfast menu includes things like grilled salmon with miso soup and natto. I had the relatively restrained pancake and bacon breakfast. And just to show that Japanese food can be great no matter the setting, the final image below is of the really excellent tonkatsu lunch we had at Haneda Airport before our return flight. Last Meal. Tonkatsu-ya. Haneda Airport.